Very often I forget to review some of my favorite beauty products. In the past that usually happened because I forgot to take pictures. But when you repurchase a product at least 10 times and make sure you always have at least two back ups on your beauty shelves, then it is high time to talk about it. 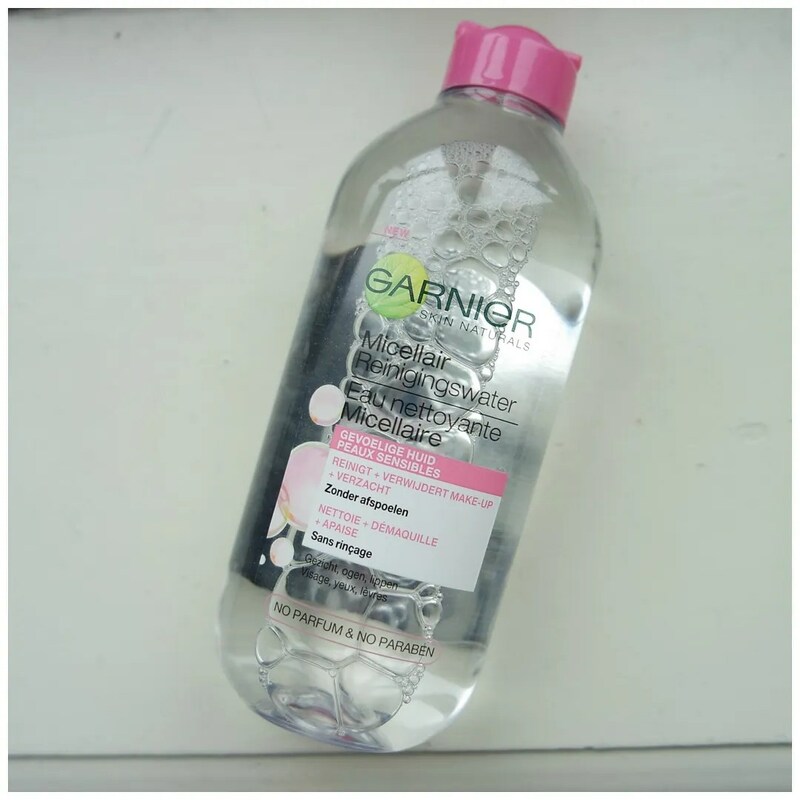 Today it is time for a review for one of my all time favorite cleansers: the Garnier Micellar Cleansing Water. My cleansing water journey started off by trying the fabled Bioderma cleansing water. I bought a mini version of the original pink capped version that inspired the Garnier one you see here. I ended up reviewing the larger size I purchased of the lesser known Bioderma Hydrabio H2O. I loved it, but at almost 15 euros a pop, and difficult to find in Holland, I knew I had to look for alternatives. 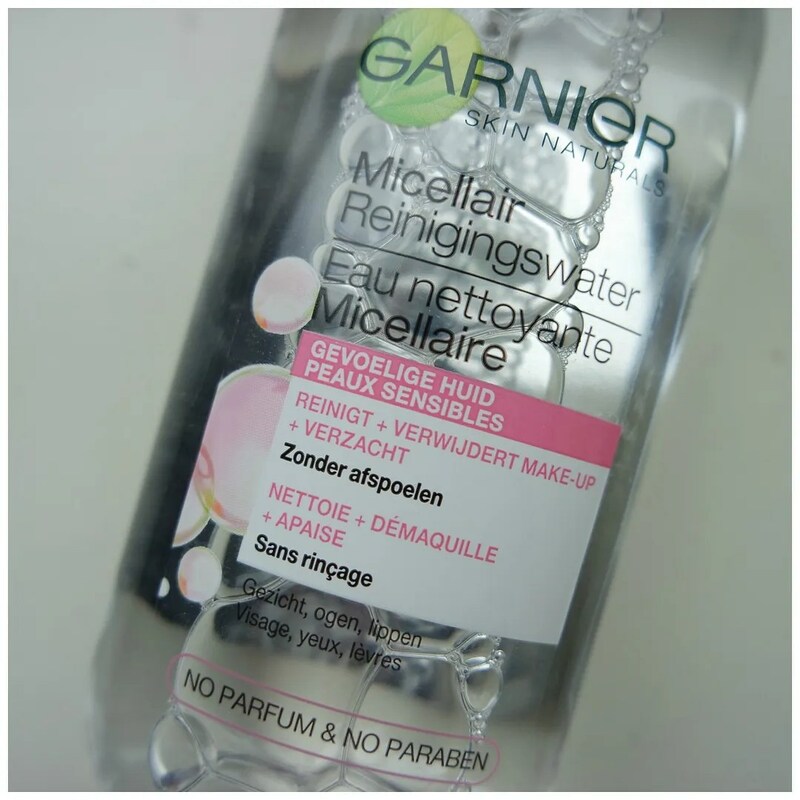 In comes Garnier with their €6.49 micellar cleansing water. At more than half the price and almost double the amount of product, this isn’t only cheap but works just as good as the cult original. The Garnier cleansing water comes in a clear bottle with a pink cap. The comparison to Bioderma is hence not a big leap. In face, Garnier has come out with a green capped version for oily and blemish prone skin which is the same color scheme as the Bioderma version for the same skin issue. To say this product was inspired by Bioderma would be an understatement. The bottle is plain and simple and easy to use. It is a tad big though, which is the only downside I can find with this product as it doesn’t fit into any of my make up drawers unless I lay it down. The pink version is formulated for sensitive skin and promises to cleanse your face, take of your make up and soften your skin. It contains no perfume or parabens and boasts the use of micelles that attract dirt and grime. The ingredient list is straightforward, which I like in my skincare products. There are only 7 ingredients in this product and that is a great thing to me. Because usually I find that the more ingredients a product has the more irritants it might contain. Compared to the Bioderma version this has far fewer ingredients, yet when you look at how these products work, they perform the same. I find micellar waters are best used for removing face make up and for a nice clean, yet not too squeaky clean, feel of your skin. For taking off eye make up and more resilient make up products such as liquid lipstick, I prefer a waterproof make up remover. I use this every morning and every evening. In the mornings I use it to cleanse my face after a good night’s sleep. that is also what you can see in the swatch above. The water comes out clear and easily takes off the grime and oils after your beauty sleep. 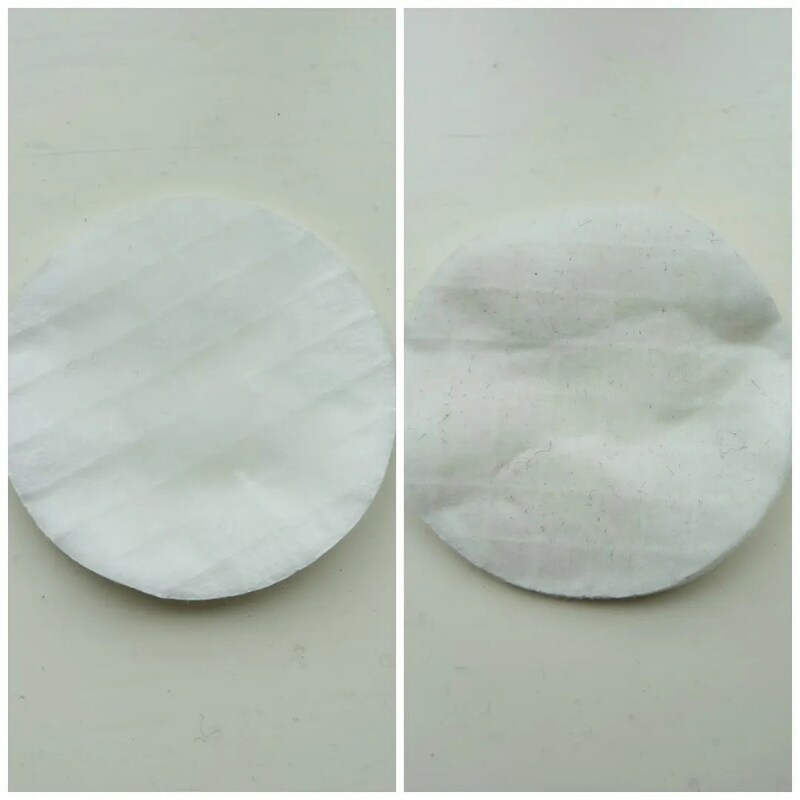 At night, I use one cotton round soaked with micellar water to take off my face make up and then another one to make sure there is no residue. I find this functions as a cleanser and toner in one and love it because of that: it means one step less in your beauty routine. 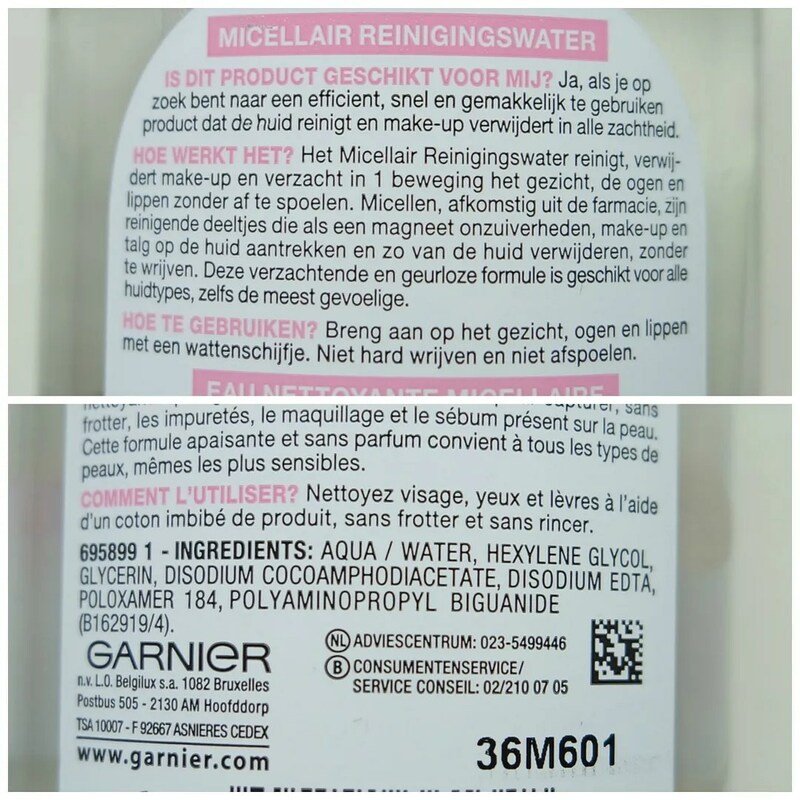 Why do I love Garnier Micellar Cleansing Water? Because it is quick and easy to use. Moreover, it is affordable, gets the job done and serves as a great 2-in-1 product. It leaves my skin feeling hydrated and in the past 2 years that I have been using this it has never caused my skin to break out, become irritated or to dry out. In short, this is one of the best skincare items on the market today. Now if all they’d do was dupe the blue Bioderma version as I found that a tad more hydrating than this one does. Are you a fan of micellar waters? Would you like me to try some more? Is heel vaak in de aanbieding en kost dan bijna niets. Dus zeker het proberen waard. I think it just recently made its way across the pond. Try it!